Developing markets have been a source of interest to pharmaceutical companies for decades and it is not a revelation that the developing markets of Latin America, in particular, have been growing in importance over the years. Indeed, the attractiveness of this region has become more and more apparent as the governments of these countries have taken great strides in developing a more robust market for the pharmaceutical industry. As the regulatory framework has evolved in this region, so too has its appeal. As economic instability spread across much of the world last year, the Latin American pharmaceutical markets remained largely insulated from the worst of it, thanks in no small part, to less exposure to credit-squeeze fundamentals and conditions ripe for outsourcing. Indeed, by many accounts the pharmaceutical industry is blossoming in that region, spurred by a number of factors. With a population of over 500 million people, the sheer size of the market makes it too large to be ignored. According to one projection by the United Nations, the overall population in this region is expected to grow about 23% over the next 20 years, to about 623 million. Moreover, there has been a steady period of double-digit growth of the pharmaceutical market in Latin America (Figure 1), and the total market growth rate in the individual countries of the region are expected to continue with double-digit growth as well (Figure 2). The region is also attractive for its competitive costs, convenient time zone with respect to interacting with the U.S. and Europe, and quality standards comparable to other traditional research markets. With approximately 50% of pharmaceutical industry growth by 2020 expected to come from emerging regions, 15–18% of this growth will be attributed to Latin America. To take clinical trials as an example of pharmaceutical industry activity, according to statistics put out by clinicaltrials.gov in 2009, over 4,000 clinical trials were conducted in Latin America. It is worth noting that the saturation of clinical trial sites in Latin America as compared to the U.S. and Western Europe stands in stark contrast: the number of clinical trial sites per million in Latin America was 2, as compared to 82 in the U.S. and 11 in Western Europe. Such lack of saturation in the region, coupled with high enrollment rates and growing regulations, make the growth of clinical trials in Latin America likely to continue all that much more in the future. However, while the clinical trial application process in Latin America is seemingly straightforward, the process is not without its land mines. Today, the majority of the countries in the region have local regulations aligned with the Declaration of Helsinki, Council for International Organizations of Medical Sciences, and International Conference on Harmonization-Good Clinical Practice (ICH-GCP) guidelines, and all of these countries have a regulatory agency responsible for pharmaceuticals, medical devices, and clinical research. However, at the regional level, despite efforts by Mercado Comun del Sur, regional pharmaceutical regulatory implementation has not kept pace with national developments. As a result, there are still different levels of regulatory sophistication in the region. The extent to which a given regulatory framework has evolved, and the corresponding infrastructure in the pharmaceutical industry that is in place, varies country to country within Latin America. Although Latin America, as a whole, provides numerous business opportunities, such as conducting clinical trials or manufacturing drugs, six countries in the region are of particular interest: Brazil, Mexico, Colombia, Peru, Chile, and Argentina. These six countries represent over two-thirds of the population in Latin America and account for approximately 70% of the clinical trials there. While these countries share some common regional characteristics, it is important to be sensitive to the differences that exist among them as well. The remainder of this article seeks to address these differences, while highlighting the opportunities and challenges in three of these markets in particular, Brazil, Mexico, and Colombia. Brazil represents the largest market in Latin America. As the political, economic, and regulatory conditions have evolved, in some sense Brazil is becoming more akin to a developed market. That said, “akin” does not mean exactly like. There are frequent political changes at the Ministry of Health and a large backlog of submissions pending technical evaluation. Nevertheless, Brazil exhibits good clinical trial and GCP expertise and despite cost containment, there is considerable growth potential. The regulatory agency responsible for clinical trials in Brazil is Agencia Nacional de Vigilancia Sanitaria (ANVISA). Since 1996, when Brazil established a regulatory framework more in line with ICH guidelines, the Brazilian market for clinical trials started to advance. This development was coupled with the establishment of a national bioethical committee Comissão Nacional de Ética em Pesquisa (CONEP) responsible for investigating institutional review boards (IRBs). As a result of these changes, the clinical trials industry began to blossom and has been growing in Brazil ever since. Any company wanting to conduct clinical trials in Brazil will need to prepare some key initial documents, namely the protocol, informed consent form (ICF), investigator’s brochure (IB), program of activities (POA), protocol approval letter from an IRB of the origin country, and insurance applicable to the Brazilian sites. There are three steps for clinical trials, and they involve the local ethics committee (EC), CONEP, and ANVISA. The processes related to CONEP and ANVISA run in parallel for a part of the overall process. In 2008 Resolution 39 went into effect in Brazil, making the CONEP and ANVISA reviews for approval a truly parallel process as in the EU. The implications are significant, since this could mean potential time savings of 6–8 weeks for the first site to reach the site initiation visit (SIV). It also granted ANVISA the ability to approve all study sites in one submission and review cycle, which would save 4–6 weeks for subsequent sites to reach SIV. If Resolution 39 proves effective, the total time for approval will be reduced from ten to about eight-and-a-half months. 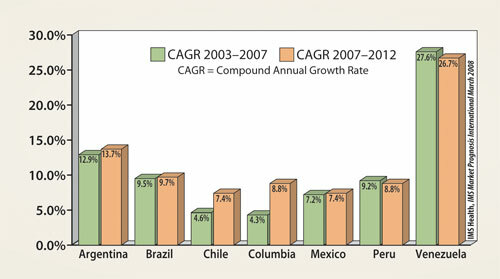 In general, the pharmaceutical market in Brazil experienced a growth of about 15% in 2008. While this is lagging the growth rate of 21.4% for 2007, it is nonetheless considerably higher than that of more established markets like the U.S. and Europe. Moreover, because Brazil is emerging from the economic downturn much quicker than predicted, demand should increase. The health sector comprises about 8% of Brazil’s GDP, or roughly $80 billion a year. In 2008, the pharmaceutical market in Brazil reached an estimated $14.9 billion, which represented 34% of Latin America. Noteworthy is that Brazilian companies only had a market share of about 20%. Also worth noting is that generic drugs make up about 20% of the market, and the growth of generics is expected to outperform the pharmaceutical market. Like clinical trials approval, product registration in Brazil is a lengthy and involved process. Only companies that have local operations in Brazil can apply for registration of medical products. The price for registering a product is low in Latin America generally, and Brazil, in particular, offers incentives for registering generics by discounting the registration application fee for such products (as well as offering a shorter evaluation time for approval for generic and similar products). For originals (new) drugs, registration in Brazil can take 12 to 14 months to be approved. ANVISA created three product categories for registration purposes: medicine products (drugs), pharmaceutical raw materials, and health products. The category for drugs is further broken down into new medicine product, similar products, and generic product. There are two avenues a pharmaceutical company can take in order to make headway into the Brazilian pharmaceutical market. One possibility is the importation of a pharmaceutical product. Since the product has not yet been approved in the source country, the Brazilian Health Authorities must inspect and approve this source product. A certificate of free sale (CFS) is not required for filing but at the least an approval letter needs to be submitted within six months and a pricing dossier is mandatory before final approval of the registration. ANVISA/CMED (Câmara de Regulação do Mercado de Medicamentos) approves the price typically within two to three months. Alternatively, a company may choose to have a local product with local manufacturing. In this case, CFS is not required for filing and approval as long as the local manufacturing is declared in the application. However, robust chemistry, manufacturing and controls (CMC) and clinical dossier are mandatory, and safety and efficacy must be proven by clinical trials. The dossier, which is almost full, consists largely of CMC data, summaries, and some preclinical and clinical reports. Phase III clinical reports are mandatory. The dossier also includes an approval letter from the country of origin. Also included is mandatory local zone IV data and a GMP certificate or inspection request for the manufacturing site. Although approval time varies depending on the therapeutic class, it typically takes anywhere from 9 to 12 months. There are many positive aspects to doing business in Brazil. While most senior officials in the ministries and regulatory agencies only speak Portuguese, some junior personnel can be found with a good command of English. Indeed, the U.S. Pharmacopeia has also recognized the importance of the Brazilian market; it opened its fourth overseas location (in addition to Switzerland, India, and China) in Sao Paulo. That said, there are still a number of stark challenges faced by a pharmaceutical company entering Brazil. In general, Brazil has one of the most complex and highest tax burdens in the world. The World Bank reported that companies will use up to 72% of profits and 2,600 hours per year toward bureaucratic obligations in Brazil. This presents a bleak comparison vis-à-vis only 430.5 hours in other Latin American countries and 202.9 hours in developed nations. Additionally, a particular problem for pharmaceutical companies entering the Brazilian market is the high incidences of nonregistered drugs prevalent in the market. Some estimates suggest that as much as 30% of the drugs being sold in Brazil are not registered. In 2008, Brazilian Federal Police seized 500,000 units of nonregistered and counterfeit medications. To address this situation, some regulatory reforms have been introduced. New legislation, which is expected to be slowly implemented in the next three years, passed in January of last year. The new law aims to enforce monitoring of pharmaceutical products by using electronic barcode systems. Mexico is the leading pharmaceutical market in Latin America. The Mexican market, as an initial entry point into the region, can serve as an important foothold for companies looking to enter the rest of Latin America. However, certain characteristics of the environment in Mexico need to be taken into account. As in Brazil, changes in the Health Ministry happen often. Moreover, currently, a number of regulations are under review which could mean more regulatory changes are on the horizon. 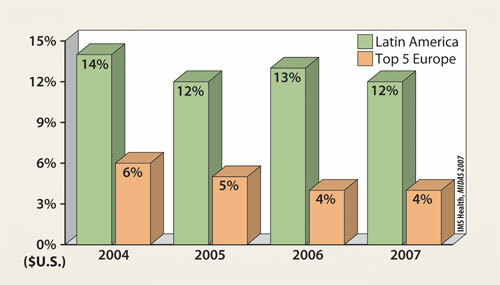 By 2012, 40 blockbuster drugs will come off patent, further signaling big changes in the Mexican pharmaceutical market. As the leading pharmaceutical market in Latin America, Mexico experienced over 200% growth in foreign direct investment (FDI) from 1999 to 2006, with $346 million FDI in 2006 alone. The Mexican pharmaceutical market has been growing at a rate of 12% per year. Most of the major pharmaceutical companies have a presence in the Mexican market. In fact, the pharmaceutical industry in Mexico is considered one of the most well developed in Latin America. It represented 1% of Mexico’s GDP, and 37% of Latin American pharmaceutical sales in 2006 were attributable to Mexico. While Mexico represents the largest pharmaceutical market, there is relatively less clinical research being undertaken there. However, the growing number of clinical trials being conducted in Mexico is an encouraging indication of the country’s potential in this area. The regulatory body responsible for clinical trials in Mexico is the Comision Federal para la Proteccion Contra Riesgos Sanitarios (COFEPRIS). The total approval and set-up process in Mexico can take anywhere between 13 and 17 weeks. Because the process is sequential, additional sites must be approved by COFEPRIS, which takes four weeks. Additionally, an insurance certificate endorsed by a local insurance company is required before a site can be activated. The key initial documents required for clinical trials in Mexico are the protocol, ICF, and IB. Ethics committees must approve the protocol per site; only once the first site’s EC approval and the site’s director authorization letter are ready can the protocol be submitted to COFEPRIS for clinical trial authorization. If a site has a scientific committee in addition to an ethics committee, approval by both is necessary. In addition to a relatively quick approval process, Mexico also has a reputation as a cost-effective site for clinical trials. A U.S. Department of Commerce report suggested that sponsors might be able to save as much as 30% in costs related to a clinical trial in Mexico, as compared to conducting it in the U.S. Moreover, a growing population in Mexico and a high occurrence of major diseases, particularly cancer and heart disease, indicated that Mexico is poised to see an increase in clinical trials. In 2008, there were 683 clinical trial sites in the country. Of particular importance to companies interested in conducting clinical trials in Mexico is a 1986 regulation, the Reglamento de la Ley General de Salud en Materia de Investigacion para la Salud. This regulation controls all aspects of scientific and technological research related to healthcare. For a pharmaceutical company entering the Mexican market, different options are available for registering new products depending on whether it is an imported product as opposed to local manufacturing. A company can file the dossier with a filing or an approval letter in the reference country. It is worth noting that only an abbreviated dossier is necessary in Mexico; it consists mostly of CMC data, summaries, and some clinical reports. However, a CFS/certificate of a pharmaceutical product is mandatory for approval. One positive recent development in Mexico has been the removal of the requirement for import licenses for drugs or for export licenses on blood serum samples. The introduction of this update has essentially reduced the start-up timeline from what was 3.5–4.5 months to 3–4 months. This is effectively bringing the Mexican regulation more in line with some European countries. Certainly, with respect to its size alone, Colombia does not hold the same importance as Brazil or Mexico. By most accounts, it would rank fifth in terms of how large its pharmaceutical market is, behind Mexico, Brazil, Argentina, and Venezuela. Nevertheless, with a market for pharmaceuticals that was worth US$1.8 billion in 2006, and a growth rate of 5%, the Colombian market is nothing to sneeze at. Indeed, Columbia has become, perhaps somewhat unexpectedly, a destination for clinical trials. The regulation of clinical trials in Colombia is entrusted to the Instituto Nacional de Vigilancia de Medicamentos y Alimentoa (INVIMA). While the 17- to 21- week time frame for approval presents a longer timeline than what is found in Mexico, it is still considerably shorter than the length of time that the process requires in Brazil. The key initial documents consist of the protocol, ICF, IB POA, and an insurance policy for the Colombian sites. Although it is required that the protocol for each site be approved by IRBs, once the IRB approves the protocol for the first site, it can be submitted for INVIMA to approve. INVIMA must then be notified of additional sites. Once a company has approval from INVIMA, it can request an import license for the study drug and other supplies. In contrast to the challenges that protocols with a placebo arm present in Brazil, there are no such special concerns with placebo-controlled studies in Colombia as long as it is approved by ECs. On the other hand, the clinical trials regulation in Colombia presents its own set of challenges. In particular, a new resolution was introduced in 2008 that requires GCP and a certification of institution by INVIMA in order for a company to be able to conduct clinical research. Consequently, all protocols that are submitted to INVIMA for approval will need to also include a copy of the submission of a certification plan. Putting aside the potential for conducting clinical trials in Colombia, the pharmaceutical market, in general, is also ripe with possibilities. Since the 1930s, when the pharmaceutical industry in Colombia essentially consisted of just three local manufacturers and ten foreign subsidiaries, the Colombian pharmaceutical market has developed and blossomed. Today, the domestic industry is considered relatively well developed although rather fragmented. This market fragmentation itself can be seen as a source of opportunity for companies entering Colombia. Also worth bearing in mind, as with most other countries in Latin America, the time and cost associated with registering a pharmaceutical product in Colombia, both with respect to new, as well as similar or generic pharmaceuticals, is significantly lower than in the U.S. or Europe. New drugs take six months to register, while similar and generic drugs can be registered in merely three months. However, although the pharmaceutical market in Colombia holds a great deal of appeal, there are also challenges to entering and operating in this market that a pharmaceutical company ought to be aware of when considering doing business there. One challenge is the high incidence of under-the-counter sales in pharmaceuticals in Colombia. Additionally, counterfeit products make up about 2–3% of the pharmaceutical market value. This particular issue, however, may become less of a concern in the future; the prevalence of counterfeit pharmaceuticals is decreasing in Colombia thanks to the adoption of good manufacturing practices. The emerging countries reviewed in this article are economic powerhouses with large populations, large resource bases, and large markets. To a lesser or greater extent, no major player in the pharmaceutical industry can ignore the importance of these economies, and those of Latin America in particular. As many Latin American countries attempt to extend healthcare to larger portions of the population, public spending on pharmaceutical products by these governments can be expected to grow; there remains significant unfulfilled demand that represents an attractive opportunity for pharmaceutical companies. In fact, despite the cost-containment efforts by the governments of a number of Latin American countries, the simultaneous efforts to expand access to medicine means that these sorts of opportunities will not be going away any time soon. Each of the markets highlighted here feature unique attributes that must be identified and understood when entering or operating in that particular country. This will remain to be true for at least the foreseeable future, since efforts at regional (or for that matter, global) harmonization have had limited success. Therefore, at least for the meantime, the regulatory schemes in Latin America differ among the countries, although many have certainly come along a great deal in their own rights respectively. The pharmaceutical industry, much like all sectors of business today, is no longer a localized endeavor. Today, more than ever, globalization plays a vital strategic role in the undertakings of pharmaceutical companies. As transnational borders become less and less important, the pharmaceutical industry is expanding its reach beyond already established markets. Certainly, Latin America is a region that has precisely this kind of untapped potential. Once pharmaceutical companies are able to effectively maneuver within the regulatory landscape of these key Latin American countries, the pharmaceutical markets there will surely evolve even further. Yelena Sheftelevich, J.D., is global regulatory manager, and Satish C. Tripathi, Ph.D. (satish.tripathi@biomedconsult.com), is president at Biomedical Consulting International.